That Disneyland preview of Sleeping Beauty appearing with The Peter Tchaikovsky Story on January 30, 1959 may have created an audience demand exhibitors couldn’t satisfy. 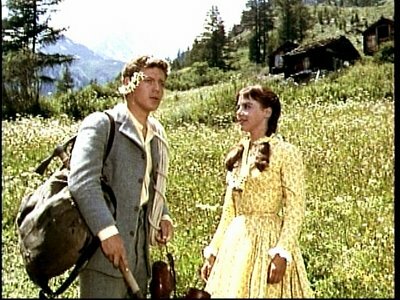 Instead of the usual saturation opening putting popular Disney shows into small towns across the country during holiday or school’s-out weeks, this was a roadshow special with advanced admissions and very limited engagements. 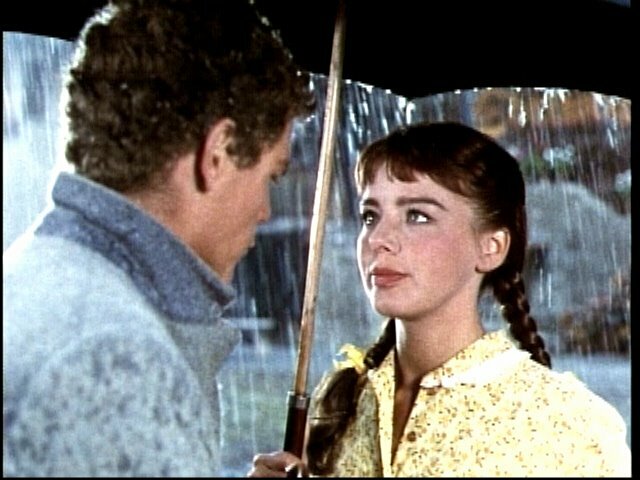 Exhibitors were up in arms over what they considered betrayal by a company whose primary audience were loyal kids and their parents filling small-town theatre seats. He is where he is today because he has drawn from the mass market, said Harrison’s Report on February 28, 1959, nearly a month into Sleeping Beauty’s exclusive 70mm release. There was no indication as to when it would become available in 35mm for standard bookings --- we cannot touch Disney now … he has deserted us at a time when we need him most. Showmen acknowledged the potential of a pre-sold likely hit, but Sleeping Beauty was no good to them if they couldn’t play it. Has he let the public down by trying to erect a monument to himself? Harrison lambasted the inflated ticket prices --- $1.25 to $1.50 for adults, and even more egregious, ninety cents for children. Sleeping Beauty should have been a picture that patrons everywhere could go to their customary local theatre (to see) instead of having to drive fifty miles or so to the local 70mm house and pay through the nose. In Harrison’s estimation, this makes a second class citizen of the small theatre and its owner. 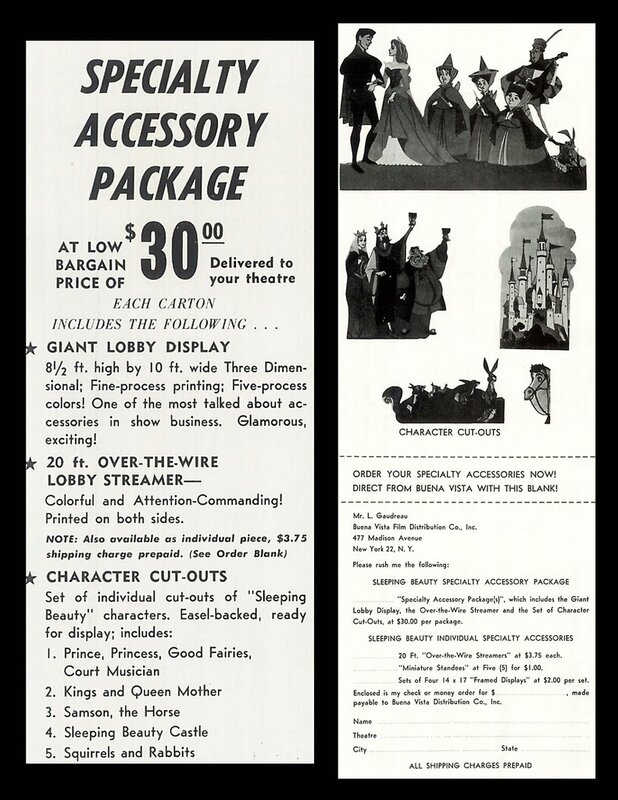 Here in North Carolina, our only 70mm venue within a two-hour distance was Charlotte, and as for Sleeping Beauty’s local run, we didn't get that until August of 1959. The Liberty’s ad above reflects the increased ticket price Colonel Forehand had to impose (we are required by the distributor …) for under 12 seating. The usual dime admission for kids was now an astronomical twenty-five cents, neatly depriving juvenile patrons of whatever snack treats they contemplated. 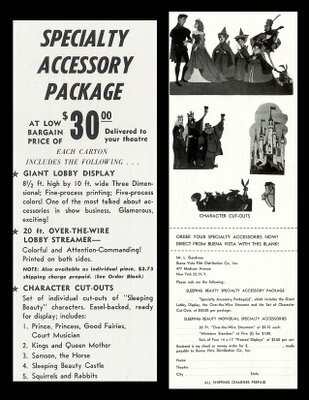 Showmen felt Sleeping Beauty’s pinch as well, judging by the cost of lobby displays shown here. Thirty dollars was enough to tip the scale from profit to loss in small situations, and I’d love to know just how many of those lavish standees Buena Vista actually sold. The Shaggy Dog was previously covered HERE, though at that time, I’d not been aware of a major flap in the Spring of 1959 pitting drive-in owners against Buena Vista. Distributors usually forgave lost revenue for young children in deference to the Under 12 Free policies most drive-ins observed. One of the major attractions for outdoor theatres was, after all, savings in baby-sitting costs parents enjoyed by bringing little ones along in back seats and letting them sleep quietly while Mom and Dad enjoyed the show. Free admissions for kids often made the difference between going to movies and staying home. For The Shaggy Dog, however, Buena Vista laid down new rules. No more percentages based only on adult and/or single car tickets. From now on, each child would be assessed at seventeen and a half cents, whatever the admission price set by exhibitors. 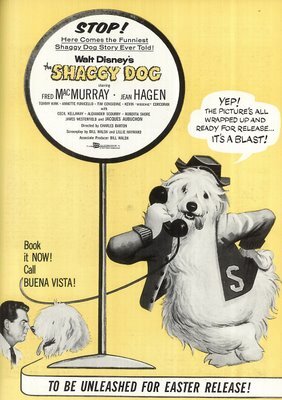 The Fresh Pond Open Air Theatre in Cambridge, Massachusetts rejected BV’s terms, and the distributor withdrew the drive-in’s Shaggy Dog license. All this ended up in U.S. District Court with the Fresh Air claiming violations of the Sherman Act and accusing Disney of engaging in price-fixing (as it happens, three of the drive-in’s four owners were lawyers). We have never charged for children and we do not intend to do so, they said. The court ultimately ruled in Buena Vista's favor, saying that since drive-ins could impose whatever admission they chose, it did not amount to price-fixing. The Shaggy Dog would go on to take the highest gross of all Disney’s 1959 releases, despite its having been made for the lowest cost of any of them. 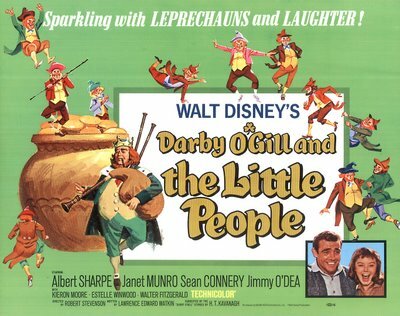 Darby O’Gill and The Little People (released June 1959) and Third Man On The Mountain (November) were both excellent pictures failing to deliver the expected audience. Was Disney’s kind of storytelling outmoded? 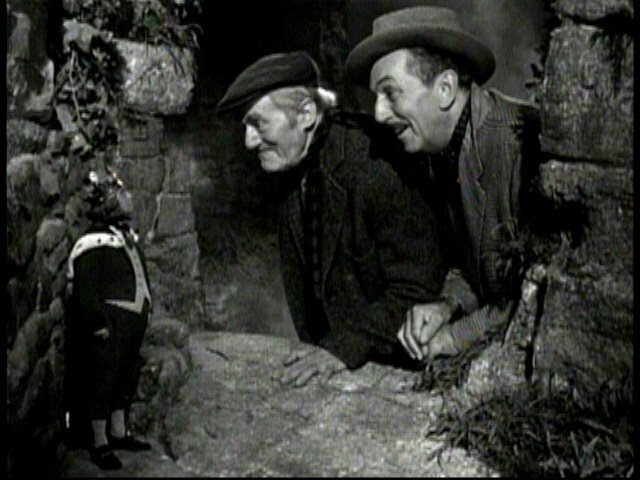 There’s a lengthy segment in the Disneyland episode, I Captured The King Of The Leprechauns, where Walt listens spellbound as guest Pat O’Brien spins his Irish folklore. Again he’s enraptured when Albert Sharpe tells of further encounters with the little people. Would kids already spoiling on cathode vines be as patient with such celebration of oral tradition? Men like Disney grew up with storytellers, before movies gained a national foothold and certainly before television wiped it all out. 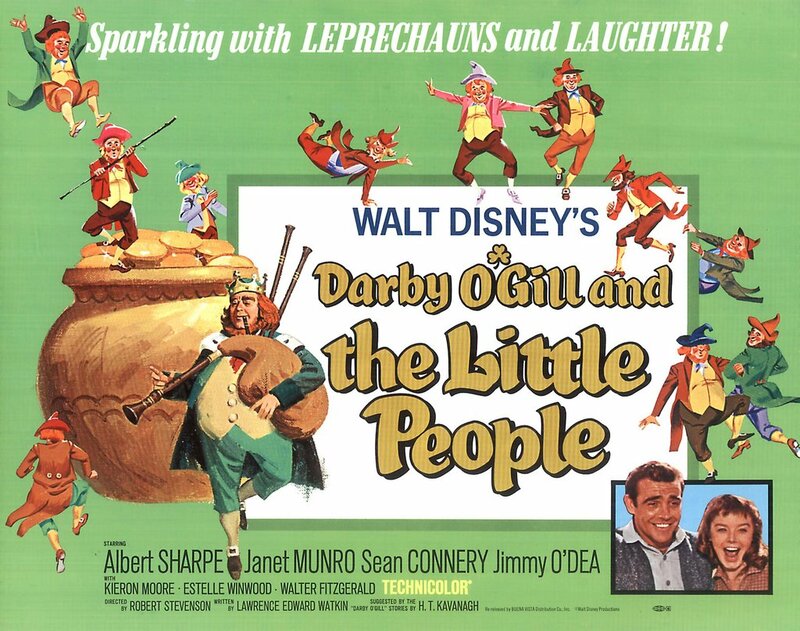 I Captured The King Of The Leprechauns was designed to excite interest in Darby O’Gill and The Little People, but I wonder if it might have actually had the opposite effect among that first generation weaned on TV. Third Man On The Mountain was a well-made mountain adventure shot in Switzerland. Disney had to reactivate his British offices in order to get the project started, not having made a picture in the UK since four he’d done in the early fifties. Producer Bill Anderson said the climbing stuff scared off the women viewers. 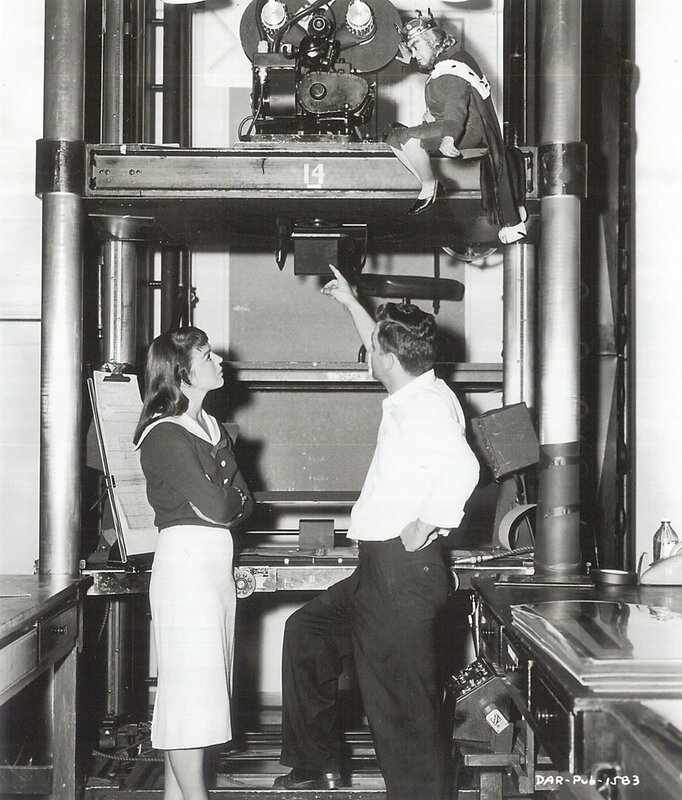 He even reported Walt’s wife as having shut her eyes for fear someone was going to fall. Could this have killed it off, or did a largely British cast and flavor put viewers off? One of the problems with Disneys that disappoint is stigmas they carry from then on. 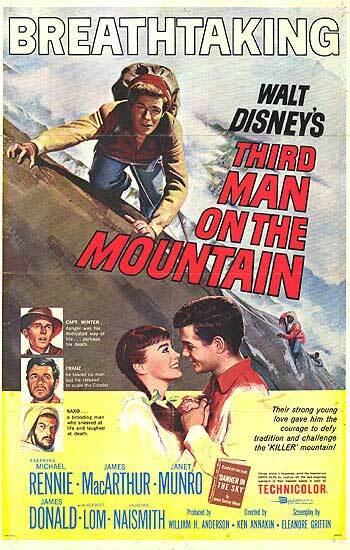 Third Man On The Mountain was released on DVD, but nothing was done by way of restoration, and the widescreen theatrical ratio was discarded in favor of a much less effective full-frame. The Disneyland promo episode, Perilous Assignment (11-6-59) was also omitted. It’s a fine movie not likely to be appreciated until Disney remasters the DVD, but I’m not holding my breath for that. Bob Thomas reported in his Walt Disney biography record profits of $3.4 million for 1958-59 followed by a loss of $1.3 the following year, the first time in a decade this company had lost money. 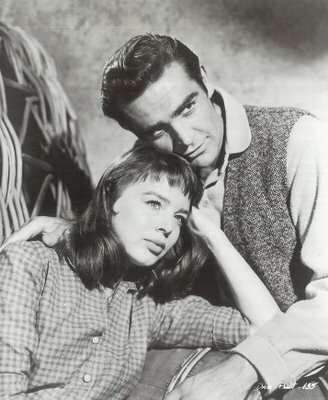 Considering those pictures released in 1960 (Kidnapped, Pollyanna, Toby Tyler, Ten Who Dared), the slow period had a while yet to run. Swiss Family Robinson (December 1960) would inaugurate a series of hits putting the company back on its stride, with 101 Dalmations, The Absent-Minded Professor, and The Parent Trap following in quick succession. It’s true Disney fell back on safe formulas encouraged by the success of The Shaggy Dog and Flubber shows, but there were nobler experiments all the way to the end of Walt’s life. The real calcification point for his "family" comedies wasn’t reached until the mid-sixties (and they are admittedly pretty dire after that --- I can remember walking out on Monkeys Go Home and Never A Dull Moment, while my willingness to sit through all of Lt. Robin Crusoe, USN was induced by my sister’s willingness to buy me a king-sized Baby Ruth at the concession counter). Holy cow. I'd forgotten I'd ever seen "Never a Dull Moment" and "Lt. Robin Crusoe USN." And I never would've remembered they were Disney pictures. As a former owner of a small town theatre, I remember the days within the last 25 years when the Disney organization not only got higher box office percentage, but also wanted a percentage of concessions! I don't know if it was the result of legal action or exhibitor boycotts, but the concession percentage was ended in short order. I was elated to see the ad for a STARS IN MY CROWN reissue. It must have been an old ad-mat, though -- while STARS is arguably "one of the fine family pictures" of any year, it came out in 1950.